This Nov. 29, 2018, file photo shows philanthropist and former mayor of New York City Michael R. Bloomberg announce Jackson, Miss., as the winner of the Bloomberg Philanthropies 2018 Public Art Challenge. Billionaire Mike Bloomberg is prepared to spend well over the $100 million he put into his last campaign for New York City mayor if he runs for president in 2020. And he does not plan to accept any outside money from political action committees if he jumps into the race, CNBC has learned. Howard Wolfson, Bloomberg's top political advisor, in an email hinted at how much his boss would look to invest into his own potential campaign for president. "Mike spent more than $100 million in his last mayor's race. Last time I looked, NYC is a fraction of the size of the country as a whole," he explained. The last time he ran for public office was in 2009, when he ran for re-election as mayor for a third term and pulled off a victory as an independent. Bloomberg spent more than $110 million backing Democrats during the 2018 congressional midterm elections. When asked if he would spend at least that on his own campaign, Wolfson replied, "Whatever is required." Former mayor Michael Bloomberg announces he'd rejoined the Democratic party -- does this mean he's eyeing a run for the White House? Melissa Russo reports. If the former New York City mayor contributes that much to his own coffers, he will have one of the largest 2020 war chests and a stark advantage over other potential Democratic hopefuls, such as former Vice President Joe Biden, Sens. Cory Booker, Elizabeth Warren and Kamala Harris and Texas Rep. Beto O'Rourke. Still, being a successful businessman may not be what voters are looking for as an alternative to Trump, especially as the party veers toward a progressive platform. In the latest Quinnipiac University poll, Bloomberg had an overall unfavorable rating of 32 percent, and 19 percent of Democrats participating viewed him negatively. However, 44 percent of those who were asked about their perception of Bloomberg said they haven't heard enough to make a decision. Meanwhile, Biden led in the poll, with 84 percent of Democrats saying they favor him over other candidates. The 2018 congressional midterms were also, in part, a reflection of the shifting landscape for the Democratic Party as liberal congressional candidates such as Alexandra Ocasio-Cortez swept away establishment Democrats in primaries and others unseated Republicans in the general election. However, Bloomberg became a kingmaker in those midterm elections, helping at least 21 Democrats win their races for the U.S. House of Representatives. Democrats finished the midterms gaining a net 40 seats in the House and losing a net two seats in the Senate. 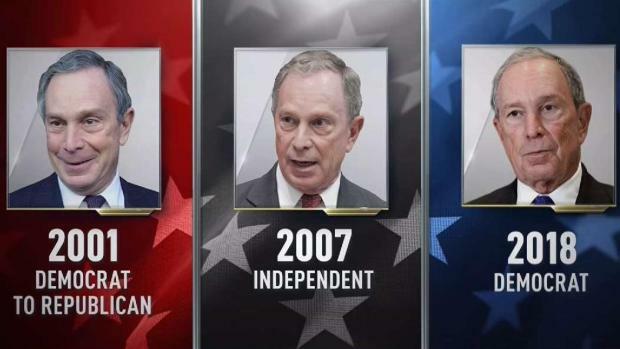 Earlier this year, Bloomberg switched his party affiliation from independent to Democrat. He had been a Republican during his first two terms as mayor. Bloomberg is ranked 10th on the Forbes list of the wealthiest Americans and has a net worth of $40 billion. His spending would surpass President Donald Trump's own $66 million contribution to his 2016 campaign. He would be 78 by the 2020 general election. The Trump campaign finished the last presidential election cycle raising just over $333 million with only $75 million coming from outside groups such as political action committees, or PACS, according to the nonpartisan Center for Responsive Politics. Trump will be 74 in 2020. Biden will also be 78. Heading into 2020, Trump has already raised over $100 million between his campaign committee and his two joint fundraising operations that work in tandem with the Republican National Committee. Beyond Trump and Bloomberg, other businessmen have spent their own money on their presidential ambitions. Ross Perot, a billionaire who ran as an independent in 1992 against President George H.W. Bush and then Arkansas Gov. Bill Clinton, spent $26 million of his personal fortune on his campaign. When Steve Forbes ran for the Republican nomination in 2000, he spent $32 million of his own money to finance his campaign. Wolfson also noted that his boss has never accepted outside PAC money and doesn't intend to do so this time around if he chooses to enter what's expected to be a growing primary field. "Mike has run for office three times and never took a dime of PAC money. Not sure why that would change now," Wolfson said. The commitment to limit corporate PAC money comes as a litany of other prospective Democratic candidates for president distance themselves from outside groups. Vermont independent Sen. Bernie Sanders, a candidate for president in 2016 who is considering another run, has led the charge against using outside money to win a campaign and to focus on attracting small dollar donations from average citizens. Jeff Weaver, Sanders' 2016 campaign manager, said in a recent interview that the Vermont lawmaker would not be changing his tactics if he were to run for president again. "He's never taken corporate PAC money. If he ran again, it would be financed in the same way as it was before," Weaver said. Sanders will be 79 in 2020. Wolfson also said Bloomberg would not turn to his own super PAC, Independence USA, for assistance. 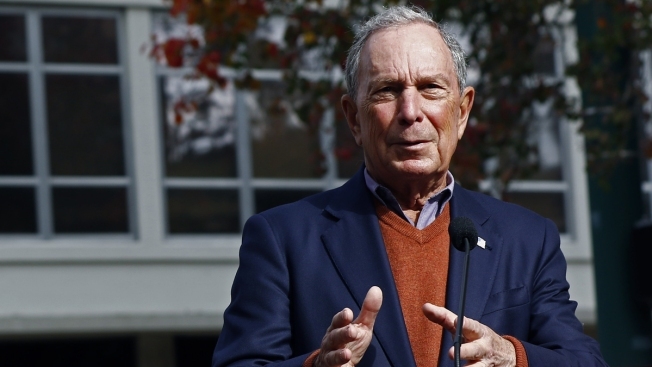 Bloomberg has been sending smoke signals that he is seriously considering a run for president. In December, he took a trip to the early caucus state of Iowa to screen a new documentary, "Paris to Pittsburgh," which shows how Americans are trying to fight climate change. While in Des Moines, he met with top political leaders in the state including the state party chair, Troy Price, and former Iowa Gov. Tom Vilsack. Shortly after the midterms, he privately met with House Speaker Designate Nancy Pelosi in New York to discuss the outcome of the midterms and introduce her to the board members of Bloomberg Philanthropies. Board members include luminaries such as Disney CEO Bob Iger, former Treasury Secretary and ex-Goldman Sachs CEO Henry "Hank" Paulson and former Morgan Stanley CEO John Mack, the group's website says. It's unclear whether these executives attended the meeting, but the entire board was expected to participate. Bloomberg's close relationship with Wall Street executives is already coming under scrutiny by a major Republican money group, America Rising. The super PAC is preparing an opposition research blitz against Bloomberg that it can deploy if he decides to run, which includes his alliance with business leaders.